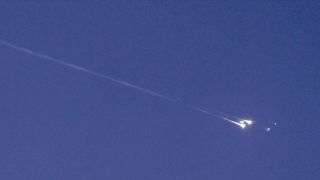 The unusual space junk WT1190F burned up in Earth's atmosphere Friday, Nov. 13 off the coast of Sri Lanka. The mysterious space junk WT1190F fell from the sky this morning, and scientists had a flying, ringside seat as the object burned up in multicolored fireballs. A new video of the falling WT1190F shows the first observations taken by a worldwide collaboration of researchers watching from a Gulfstream 450 business jet as the object returned to Earth to meet its fiery doom. European Space Agency officials suggest the debris is likely from an old rocket mission, and the science team's analysis should help reveal the space junk's ultimate origin. The object re-entered the atmosphere around 1:19 a.m. EST (0619 GMT), midday off the coast of Sri Lanka where the pieces came down. Although it glowed brightly enough to appear in the daytime sky, earthbound viewers were out of luck: A cloudy sky blocked most of the show. Luckily, the flying researchers were able to measure with a variety of cameras and instruments as the approximately 3-foot (1 meter) object burned up in the atmosphere. A close-up view of the strange object WT1190F, which burned up in Earth's atmosphere Friday, Nov. 13 off the coast of Sri Lanka, as imaged by scientists measuring the re-entry from an airplane. Researchers discussed the newest images on a Slooh Community Observatory webcast this morning, where noted fireball expert Mark Boslough, from Sandia National Laboratories in New Mexico, discussed the junk's probable origin based on its unusual, highly elliptical orbit around Earth with Slooh host Paul Cox. "There aren't that many things we launch into orbits that would take them beyond the moon, so it's most likely a piece of a lunar mission," Boslough said in a webcast. He added that it could potentially be part of a rocket or fuel tank from the Apollo missions in the 1960s. A piece of weird space junk just a few meters long (shown by arrow) fell to Earth and burned up in the sky the morning of Friday, Nov. 13 — scientists with the Catalina Sky Survey had been tracking the object since 2013, and as it moved closer even more telescopes could capture it. Slooh said that the junk fell at 24,600 mph (39,600 km/h), which is why the glow was so bright despite the small size as the object broke up. "Every kilogram [2.2 lbs.] of material has about the same amount of energy as 10 kilograms [22 lbs.] of high explosives when it's moving that fast," Boslough said. The flying observations came from the Next TC3 Consortium Asteroid Detection and Early Warning Team (referring to 2008 TC3, the first asteroid to hit Earth that was spotted in advance). As the high-quality video, spectroscopic readings and other measurements come back, more about the space junk's source should become clear, researchers agreed — and the observations will also feed models of debris re-entry and help refine tracking methods that could be used on future incoming objects and asteroids.